Few people know this, but Michigan is one of the toughest states in the nation in which to bring a slip and fall case. That is because the Michigan Supreme Court decided to do the legislature’s job and impose an additional rule regarding negligence called the “Open and Obvious Rule”. Let’s start at the beginning though. Generally speaking, a slip and fall accident is one where a person is injured by slipping, tripping, or falling due to a condition on a premises that makes it dangerous. It can happen inside a building, or outside a building, and can be caused by anything as simple as ice and snow, to actual defects in the property. Before the Michigan Supreme Court got involved, it was necessary only to prove that the premises owner, including building owners, business owners, and even homeowners, keep their premises in a reasonably safe condition and protect against unreasonable harms caused by dangerous conditions on their premises. It has always been necessary to prove that there was a defect, that the business owner or owner of the property had notice of the defect, that the defect caused the injury suffered by the person bringing the action and that the injury caused damages to that person. The Michigan Supreme Court’s “Open and Obvious Rule” added an additional element to the mix. Now in addition to all the other things a victim of defective property had to prove, they now also had to show that the defect was not one that was “open and obvious” or, in other words, one that was not observable under casual observation by the reasonable person. It does not matter to the courts whether or not you, the victim, saw the defect, what matters is that had anyone casually looked to the ground they could have seen the defect. Of course, some defects are not avoidable making them even more dangerous. The Michigan courts have no pity on these people. Let’s say that your elderly mother needs milk and bread and can only walk to a store located near her home. If, to get to the store, she has to traverse over a lake of ice that has been allowed to build up in the store’s parking lot, she would be unable to bring an action against the property owner if she in fact fell and hurt herself. Unfair? You bet, and there are only a few exceptions to the “Open and Obvious Rule”. That’s why you need experienced attorneys to handle slip and fall cases in Michigan. 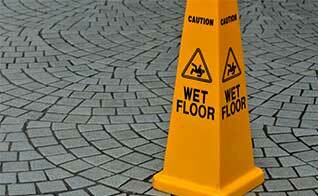 The attorneys at Wigod & Falzon have been handling slip and fall cases for a cumulative total of over 150 years. We know the law and we know how to handle these cases to avoid the pit falls of the “Open and Obvious Rule”. Like in every other accident situation, be careful who you speak to and who you give statements to. The words you use and how you describe the events leading up to the accident could permanently effect your rights to bring an action against negligent property owners. Let the experienced attorneys of Wigod & Falzon guide you through the process. Call us before you make any statement regarding the accident, and let us give you the free advice necessary for you to avoid having your case be declared ineligible by the Michigan Courts. Once again, if the Michigan personal injury attorneys at Wigod & Falzon do not produce results, you pay no fee.